양평 용문사 금동관음보살좌상은 고려후기 14세기에 크게 유행하여 전국적으로 확산되었던 금동보살상의 전형을 보여주는 상이다. 이 유형의 보살상은 현재 대마도 관음사에 봉안되어 있는 서산(瑞山) 부석사( 浮石寺) 금동관음보살좌상(1330년), 국립중앙박물관 소장의 금동관음·대세지보살입상(이왕가박물관 구장(舊藏), 1333년), 국립전주박물관 금동보살좌상, 청양 운장암 금동보살좌상 등을 꼽을 수 있으며 선운사 도솔암 금동지장보살좌상도 같은 양식범주에 넣을 수 있다. 이 형식의 보살상은 살이 많은 방형의 얼굴에, 사실적인 이목구비, 가지런한 앞머리, 어깨 위에 흘러내리는 수발(垂髮), 가슴에는 화려한 목걸이 장식, 양 무릎 위에 표현된 영락 등으로 그 특징을 요약해 볼 수 있고, 이 밖에도 소매가 있는 대의형태의 옷을 입고, 양손은 엄지와 중지를 맞댄 설법인(說法印)을 결하고 있으며 내의를 묶은 매듭이 나타난다. 특징적인 표현으로는 왼쪽 가슴에서 밖으로 드러나는 긴 삼각형 모양의 내의(內s衣)장식을 꼽을 수 있는데, 내의에 헝겊을 두껍게 겹쳐 만든 장식을 연결하여 어깨에 걸었던 것으로 보인다. 이 장식의 불상이 나타나기 시작하는 것은 당말오대(唐末五代)부터이며 대표적인 예로는 메트로폴리탄박물관 목조보살입상을 꼽을 수 있다. 근진미술관(根津美術館)의 아미타여래도(1306년)을 보면 내의장식에 화려한 문양이 보이는데, 고려후기 불보살상에서는 용문사 금동관음보살상에서와 같이 둥근 화문(花紋)을 새김으로써 화려한 내의 장식을 조각적으로 표현하고자 하였던 것으로 생각된다. 용문사 금동관음보살좌상은 보관이 후보(後補)되었다는 점을 제외하면 보존상태가 양호하고 조각적으로도 우수하며 고려후기 14세기 금동보살상의 특징을 잘 보여주는 상이다. 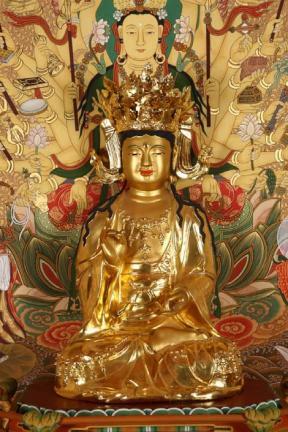 The Gilt-bronze Seated Avalokitesvara Bodhisattva of Yongmunsa Temple, Yangpyeong, shows the typical style of Buddhist statues that became hugely popular nationwide during the late Goryeo Period (c. 14th century). 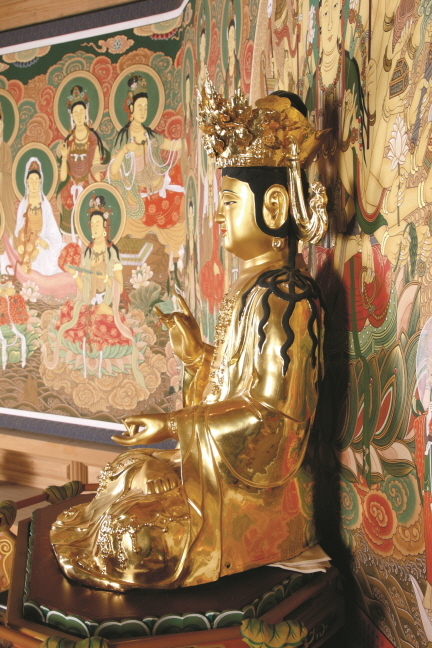 Other Buddhist statues that exhibit similar characteristics to this statue include the Gilt-bronze Seated Avalokitesvara Bodhisattva (made in 1330) of Buseoksa Temple, Seosan, which is currently kept at Kannonji Temple in Tsushima, Japan; the Gilt-bronze Standing Mahasthamaprapta Bodhisattva (made in 1333) at the National Museum of Korea; the Gilt-bronze Seated Bodhisattva at the Jeonju National Museum; the Gilt-bronze Seated Bodhisattva at Unjangam Hermitage, Cheongyang; and the Gilt-bronze Seated Ksitigarbha Bodhisattva at Dosoram Hermitage of Seonunsa Temple, Gochang. 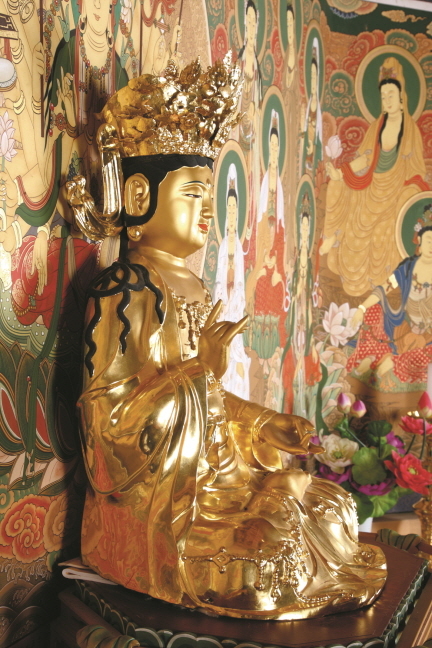 Although the jeweled crown worn by Avalokitesvara Bodhisattva was restored at a later date, the statue has been well preserved overall and displays all the hallmarks of sculptural excellence.